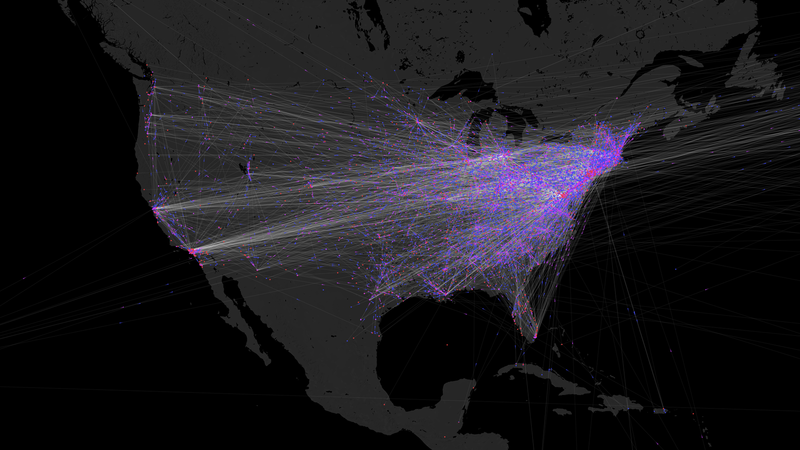 The following interactive visualisation explores the movements of 10.896 Representatives of the United States Congress, from Roger Sherman's birth in 1721 up until all its members in 2015. The Representatives move from their place of birth to their place of education and finally to their possible place of death. Click here to open the interactive visualisation. Last April, we gave a talk at the tenth Historical Network Research workshop in Düsseldorf about the 'Reversed Classification' functionality in nodegoat. To illustrate what you can accomplish with this functionality, we queried Wikidata to get a dataset of all the members of the US House of Representatives, including their date and place of birth and death, their professions, and the institutes where they took their education. We used this data to perform a reversed classification process that groups the representatives into career politicians or politicians with a heterogeneous career. From there, you could start looking at geographical patterns or educational backgrounds of these groups. See a graph of this network with these two 'career' nodes included here (canvas). The diachronic geographical visualisation of all this data in nodegoat turns out to be a nice bonus.